Junior Achievement started, Tom Davis was born in Winston-Salem on March 15, 1918. While still in high school, Tom Davis learned to fly and received his pilot license in 1934 from the Camel City Flying Service, owned by L.S. McGinnis, in Winston-Salem. He had yet to earn his driver's license. He later earned an instructor's license. After returning from the Univesity of Arizona, he worked in 1939 for Camel City Flying Service as a salesman, selling more than 100 planes in his first year. In 1940, Camel City's owner had problems paying a note, and Davis paid the note and became vice president, treasurer and principal stockholder of Camel City. He changed the name to Piedmont Aviation, Inc. In June 1943, Davis was elected president of the company. In 1944, Davis wed Nancy Teague. During World War II, the company ran flight training schools for the government in Winston-Salem and Greensboro. Realizing that these contracts would be cancelled at the end of the war, Davis applied for license for local-service passenger service. On April 4, 1947, Piedmont received rights for Route 87 -- linking various cities from Carolina to the Ohio River Valley. But the start was delayed by court battles that went to the US Supreme Court. On January 1, 1948, Piedmont Aviation was created and on February 20, 1948, the firm's first flight began. The company used two used DC-3s to provide local air carrier service. As a scheduled airline company, Piedmont made less that $250,000 that first year of service. 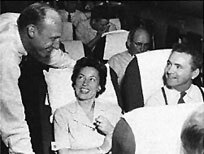 By 1955, the regional airline had operating hubs in Winston-Salem-Greensboro, Roanoke and Bristol-Johnson City-Kingsport -- leading the industry in pioneering multi-hub operations. With airline deregulation in 1978, Piedmont further established hubs in a number of cities -- Charlotte, Baltimore-Washington, Dayton and Syracuse. In 1981, Davis became chairman and CEO of Piedmont, serving until his retirement on May 4, 1983. US Airways acquired Piedmont Airlines in 1989. His philanthropy was widespread, including Wake Forest University, American Lung Association and many others. He served on the boards of numerous companies, including Wachovia, ALLTEL, Duke Power, Norfolk and Western Railroad, etc.